We believe that everyone should be treated equally, no matter if you are a tenant or a homeowner. That’s why Experian has partnered up with Big Issue Invest, the social investment arm of The Big Issue Group. By working together, we have created The Rental Exchange to help tackle the challenges faced by rental tenants in the UK. Our initiative aims to tackle the financial, digital and even social exclusion challenges that rental tenants often face compared to homeowners. By observing rental payment data in the same way that we view mortgage payment data, we can unlock a range of benefits for tenants, housing providers and credit providers. 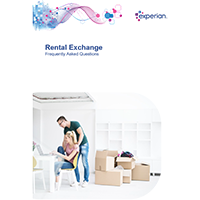 The Rental Exchange will incorporate a tenant’s payment history in their credit file with no cost to either the housing provider or tenant. It gives you an online proof of identity, so you can build a positive credit history. It will help when applying for goods or services and can help towards increasing your access to mainstream credit. It will help Local Authorities, Housing Associations and ALMO’s to support financial inclusion and help tenants to access affordable credit and services. Allowing you to build steady, long-term social housing leases based on a proven track history. Make accurate, fair and informed decisions when evaluating new and existing customers for credit purposes. It also allows you to offer services to help a wider group of individuals. It will help to encourage on-time rental payments from tenants, whilst offering them the facility to build their credit file.